Rooms Paris Hotel - Best Western Hotel le Montparnasse Nearby is the Tour Eiffel, the Jardin du Luxembourg, the Rue de Rennes and many restaurants and shops where you can stroll at your leisure. 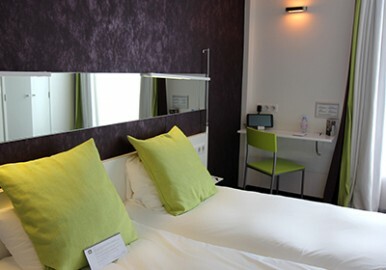 The Best Western Hotel Le Montparnasse has 28 rooms, and you have the choice between two different ambiances. Calm, they all have good quality bedding and soft quilts for a restful night’s sleep. In order to facilitate your departure, we are pleased to inform you of our new “check out express” service. Please just us know upon arrival.